Although the Mini Super Twos formula is more cost effective than many other 'contact' formulas it is not the sort of purchase to rush into unless you're sure that racing a Mini Super Twos is something that you will enjoy doing. For this reason we hire the Mini Super Twos, either on a `one off’ or multiple meeting basis. All cars are as close to identical as possible. Its all down to the driver!! 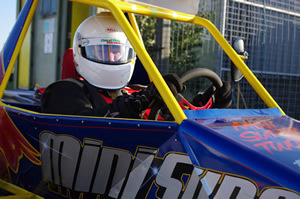 Hiring a Mini Super Two on a SINGLE HIRE is £185.00. A £30 non refundable deposit is required for each booking. All we ask of you is to fill in a Day License Form, for the track your racing at and for Mini Super Twos and a Disclaimer Form. You can also license with the Mini Super Twos/Track and gain your racing points towards championships. All forms are available from us and can be posted to you before your meeting or completed on the day of the booking. You will need to a supply fireproof overalls, fireproof balaclava, fireproof gloves and a helmet. Hiring a Mini Super Two is easy!! Just contact us either on here, seeing us at the track or by calling on 07850 912 842. Just to check availability and to let us know what track and day you are wanting.